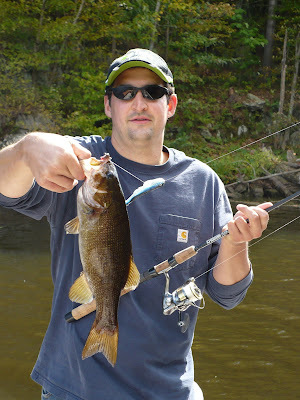 Catfish On The Lake: The Return To Black Lake......Part V, "Mixed Bag Monday"
The Return To Black Lake......Part V, "Mixed Bag Monday"
A nice smallmouth taken from below the rock walls on the Indian River. Weather:Cool morning then warm. 10mph NW wind. Moon:Waxing, 3 days before full. Chris and I were fairly confident that we had enough solid info to catch some fish. We formed a general game plan, and started off early Monday morning with a half-hour motor from our camp towards the southern end of the Black Lake. Our first stop was a rocky shoal in 25-feet of water; a spot Captain Dave described as the best on the lake. We anchored, dropped our lines and tossed lures, but despite reading tons of fish on the sonar, they did not feel much like biting. Chris managed to catch a couple crappie before we decided to make a move. Our next destination was a deep hole in the Indian River, which flows into Black Lake. We trolled some mussel beds along the way, where I wound up donating a few crankbaits while Chris caught a smallmouth. After giving away enough gear for the day, we proceeded up the river. The Indian River dumps into Grindstone Bay at the southern end of Black Lake. Both the bay and the river were littered with boats fishing for panfish, but we were looking for some larger game, in particular walleye and catfish. Legend has it that both of these species inhabit the deepest parts of the hole below the "rock walls" throughout the year. 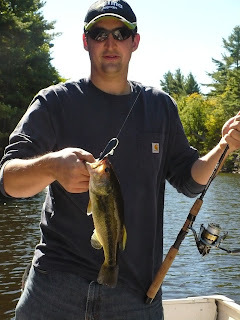 Chris managed a few small cats, but the walleye didn't bite. At this point, I was drawing the skunk, however, that would soon change. I started trying an assortment of lures, and over the next hour landed one largemouth in addition to a half-dozen nice smallies. 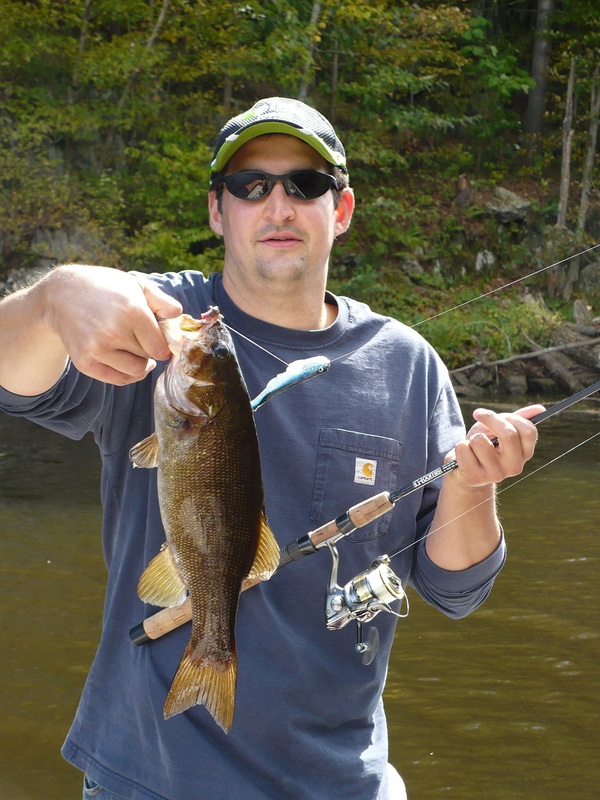 Chris added a smallie as well before we decided to head back and check out a few more spots. None produced anything special. So, were the fish jumping on the hook? No. But we did catch some and a few nice ones at that. All in all, it wasn't a bad start, especially for a couple of newbies.